I’ve been an angler for 27 years and worked for the Environment Agency for 15 of those. For some reason I have always had an affinity with water and fishing. My dad was never an angler but I used to tag along with the older kids in my street when I was about 9. I wasn’t allowed to visit the river on my own, but I’d sneak down there. I have distinct memories of hearing my dad arrive at the gravel car park, near the river in his van, during late summer evenings. He’d calmly collect me and my kit, and have a bit of a laugh with my mates and then give me a right telling off on the way home – it happened most nights! My parents became very supportive when they realised I got a lot out of fishing. When I was about 13 I joined my local angling club, Brampton Angling Society, and I started match fishing there. They were ace, providing me with lifts and tips… and the odd bit of tackle. That’s when my fishing really started. I won my first match with 12lb of roach and went from there. I almost exclusively match fish these days and I fish for a top flight team, Browning Hotrods, so the fishing I do is very involved. I think I spend more time preparing than I do actually fishing, so it has become very time hungry. I fish at least once per week, but may spend a whole month (weekends) on a venue practicing for a big event. I’ve fished all over Europe including Ireland, Germany and Denmark and I’m lucky enough to fish with and alongside some of the best match anglers in the country so I try to learn what I can, when I can. When I first started working for the Environment Agency I spent all week measuring and counting fish; the last thing I wanted to do was go fishing at the weekend. Nowadays, I find it really useful being an angler as it’s great to add the angler’s perspective to all sorts of work; from understanding what anglers actually want, to understanding the industry, the venues and the people behind them. It’s very difficult to please everyone, but I feel that if you want to make a change, the best place to be is at the table. I think anglers should all think about the environment more: biosecurity is a hot topic at the moment given the number of disease outbreaks we’ve had this season. I’d love to see everyone using dry nets to prevent the spread of diseases like KHV and SVC and parasites – it’s simple, free and effective. Dry nets are safe nets and this provides a realistic way of protecting all of our fisheries – check out our check clean dry campaign. I currently manage the Fisheries, Biodiversity and Geomorphology team covering the Great Ouse from Brackley to Kings Lynn. I manage a team of 12 made up of fisheries officers, enforcement officers and biodiversity staff. In essence it is my team’s role to protect fish and fisheries and ensure that the Environment Agency, its partners and the people we permit are delivering activities that do not harm the environment – specifically fisheries. I am also the Area’s Fisheries Technical specialist so I advise the Environment Agency and our stakeholders on technical fisheries elements influencing people to think about fish and fishing. 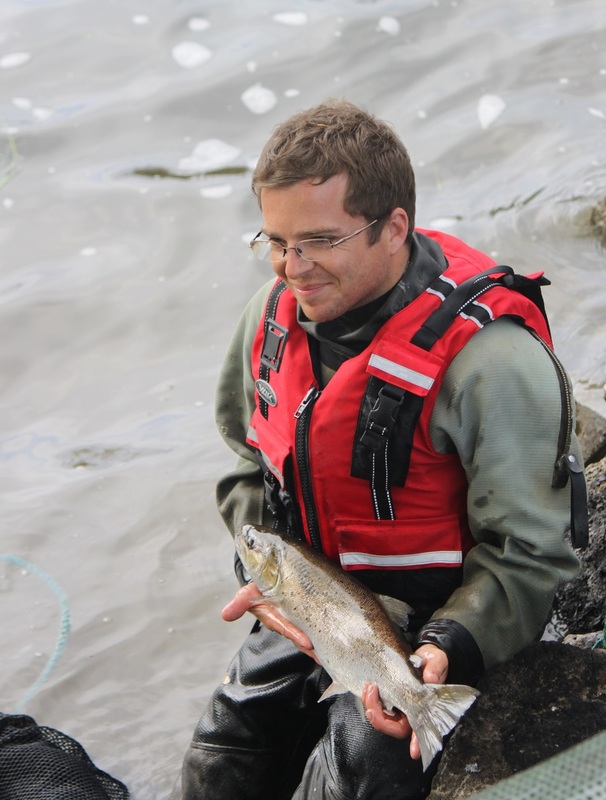 This might include assessing the impacts of a new development, designing fish and eel passes, creating technical guidance, furthering fisheries science. I’m working with Bournemouth University studying barbel populations on the Upper Ouse, the results of the PhD will be published very soon. Check out our underwater Youtube footage too “Fish taking refuge at our aeration equipment during a WQ event in the fens and the importance of tree cover”. I have covered most roles in fisheries during my career, from fish surveys, and incident management to rod licence enforcement and river restoration. It’s amazing how technical fisheries is, but also how important it is to the Environment Agency. My team and I work with almost every function internally and have access to a vast number of external partners including Rivers Trust, Canal and Rivers Trust, Angling Trust, local angling clubs, landowners and individuals. In the early days of my role I was also heavily involved in angling coaching. I managed our coaching programme and coached thousands of new anglers either directly or through angling clubs or fisheries. It was a great time and it really seemed to work. That role, and the rod license funding for it, has now been passed onto the Angling Trust who are doing a sterling job. I love being outside, competing against other anglers and the fish. I sometimes find myself wondering why I spent 3 days tying hooks and rigs to catch one perch or worse, nothing; but on the days it goes right, it’s the best feeling ever. I’ve seen some amazing sights, huge fish, strange fish, amazing wildlife – I watched a pike eat a coot, an angler and his kit lifted off the bank and into the river by a mini tornado, and many happy faces. I have lots of fishing heroes; Mark Pollard’s consistency is amazing, and his ability to win with small fish has always impressed me. I’m lucky that I fish alongside him a lot in some of the bigger events. Bob Nudd is a class act too, he has a great ability to work out the best method at a venue and then be the best at it. He’s achieved so much individually and for the sport… he’s a legend, and still going strong! Sometimes I get asked what my dream job is; and it really is this - it’s THE job I have wanted since I can remember, my higher education was based on a fisheries role with the Environment Agency, and I never forget how lucky I am. Otherwise my dream, dream job, would be retirement so I could fish more! I would sum fishing up as time, effort and fun. New water quality standards are in place at bathing beaches – so what’s changed?